The Nicholas Brothers & A. T. W. Penn: photographers of South India 1855–1885. With a foreword by John Falconer. Small 4to, (252 x 282 mm), pp. xviii, 252 (including 105 duotone plates and 151 black and white figures); pictorial boards. An examination of the successful studios established by John and James Perratt Nicholas and Albert Penn in Madras and Ootacamund. The majority of the photographs are published here for the first time. Also includes a copy of the scarce Nicholas & Co. 1881 catalogue listing over 450 subjects. 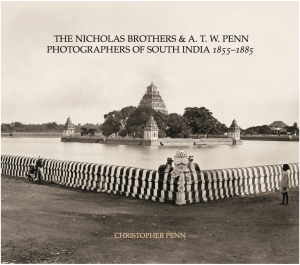 The book begins with the early years of the Nicholas studios in Madras and Ootacamund, explains how the business achieved success in the 1870s and 1880s and concludes with the introduction of the Kodak, the rise of the amateur photographer, and the inevitable decline in the studios’ profitability that followed. If you would like to purchase a copy for £35 + £10 P&P please contact us.